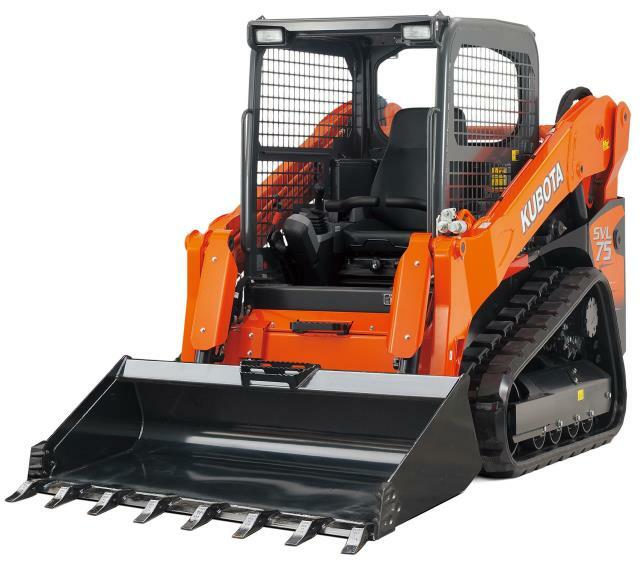 This Track Skid Steer machine is intended for dirt surface only. Track machines provide better stability, traction, lifting and pushing power. Track machines provide better grading advantage than rubber tire machines. Requires a minimum 3/4 ton pickup with a class III receiver hitch. Equipped with auxiliary hydraulics for hydraulic attachment use. Lift capacity: 2,700 lbs @ 50% of tipping load. Hydraulic pump flow: 22.5 gpm. 116" to the bottom of level bucket for dumping into tall trucks. - Weighs 9,314 lbs - 72" wide - 82" tall. - 15" Wide rubber tracks create 5.6 psi of ground pressure and provides excellent flotation in wet or muddy conditions. - 74 hp diesel engine w/20 gal diesel fuel tank. - Elec. over Hyd. hand controls are switchable between "H" control or "I" control for operator preference. - 12.6" Wide rubber tracks create 5.7 psi of ground pressure and provides excellent flotation in muddy or wet conditions. Smooth or tooth bucket is included. Trailers and/or same day delivery are available.